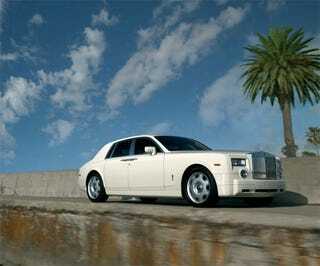 For generations, Rolls-Royces were the automotive equivalent of a white wedding dress. Pretty, but who you trying to fool, honey? Yes, the badge said Rolls-Royce, but wink-wink, nudge, nudge, Elton John covered his in rhinestones, but come on — they weren't very good cars. Sure, we'd love to get our mits on a Phantom IV. Or better yet, a Camargue! But even then you're talking 189 hp from a 6.75-liter V8 coupled to a GM 3-speed autobox. Woo frigging hoo. And at least the Camargue was kinda nifty looking. Most Rollers are frumpy, bulgy looking things. But they had a lot of leather and walnut and wool and odds are you weren't doing the driving anyhow, so did it really matter that the emperor was wearing little more than a pair of speedos? To BMW it did. Flush with cash and hubris BMW purchased Rolls-Royce in 2003 and set about modernizing the moribund brand. Volkswagen had gobbled up Bentley and was planning to stick two turbochargers into a 2-door Phaeton and call it a Continental. Mercedes was busy breathing life back into the Maybach name with an elongated S-Class fitted with... twin-turbos. BMW then had every reason and right to stick a massive grill on their 7-Series, plumb in a couple of turbochargers and pray that the NBA takes a liking to their new Rolls. Only they didn't. Instead, BMW took a chance. No, BMW decided it best if they built a new car from the ground up. Well, almost from the ground up. True, about 15% of the Phantom is shared with the 7-Series, but those are mostly bits and baubles like the motors for the windows and seats. Essentially meaningless. Besides, finding the check engine light on your Roller is from a 760Li is much less jarring than discovering the cup holder in your DB9 comes from a Five Hundred Taurus. Also, the 6.75-liter V12 is based on BMW's 6.0-liter V12. Other than that, the Phantom is bespoke. The engineers started with an aluminum space frame. While more complex and costly than a monocoque design, a space frame has the advantage of being much more rigid — like all modern NASCARs. I remember speaking with a person intimately involved with the Phantom project about the strength of the chassis and him whispering, "It's so completely over-engineered. You could drive it through a brick wall, through a house! We made it much, much stronger than it needed to be." Indeed, the Phantom's chassis is twice as stiff as an F1 car's, despite being severely more massive. Even the dashboard is a single, solid hunk of magnesium. As far as that engine goes, the modest bump in displacement only nets a few horses over BMW's 6.0-liter mill (453 hp vs. 438 hp) however, the torque increase is significant. That extra three quarters of a liter (and some ECU rejiggering) raises the twist from a mighty 444 lb-ft to a massive, Bentley-like 531 lb-ft. That much thrust is of course what allows the 5,600 lbs. beast to hit 60 mph in 5.7 seconds (the same as a WRX for those keeping score) on its way to a limited top speed of 150 mph. The Phantom can also run the quarter-mile in 14.03 @ 100 mph. Not bad for a yacht. One more bit of fun; in lieu of a tachometer, RR fitted the Phantom with a reserve power meter. Simply put, under acceleration the car lets you know how much power you have in reserve. Supposedly, unless you have the car flat out at 150 mph, the big Roller always has something left to give. But of course talking about the Phantom's performance is a bit like arguing about Gisele Bundchen's IQ. That's not why you buy a Rolls-Royce. Obviously, there are faster cars. There are even faster sedans. But there are none better. Nor more luxurious. Does your Maybach have Art Deco lighting fixtures? We didn't think so. Or organ stops to control the vents? In fact, aren't your vents — gasp — from the S-Class? In fact, I believe your Maybach steering wheel is also from a Mercedes-Benz, and says "SRS." The Phantom's tiller looks like it was ripped from the Honey Fitz. As for seats, sure the Maybach has reclining lounge chairs pilfered from a Learjet. Whereas the Phantom features a couch. As Clarkson noted, he's surprised there isn't a wood burning stove. Yes, the Maybach has a public address system so you can yell at the proles, but honestly, why would you ever want to talk to the peasantry? Just have your chauffer shoot them. The options list and attention to detail are simply staggering. Do you require an electronic, trunk mounted safe welded to the space frame? Done. Or how about a chilled wine cooler (wood trimmed of course) instead? Not a problem. We particularly like the humidor built into the glove box. For a fee, Rolls-Royce will happily build your entire interior out of a single tree. All the leather comes from Bavaria, but not from cows as that leather is too stretchy. No, every inch of hide inside the Phantom is from bulls. Squirrel and ox hair is used for the brushes to apply the pin striping (we're not making that up). They'll even festoon the thing inside and out with your family crest should you so desire. And we do desire — all we need is a family crest. Everything mentioned is just the ludicrous tip of the ridiculous iceberg, for in Crewe money ultimately talks. Then of course there are the Phantom's looks. Flabbergasting. Like a few other cars we can think of (Nissan's new GT-R springs to mind) pictures do not in any way do the big Rolls justice. Designed in California by Marek Djordjevic the Phantom simply gets it right — he even got the tail lights right (British cars have tiny rear lights). I happen to live on a blind corner and one day a gray Phantom came along. I stood jaw dropped as the thing kept coming and coming and coming. One cannot overstate its size. Nor its presence. In fact, that week I happened to be testing the Ford F250 Outlaw and the big Brit was in no way dwarfed by the giant American. Quite unlike every other car on the road, I should add. To see one is to desire one. Perhaps this is why sales took a sharp upswing in this, the Phantom's third year of production. We'll take the long-wheelbase edition, with the in-floor foot rests and the dual televisions, black on black with yellow seat piping and stainless steel veneer inlays, please. Did we even mention the suicide doors? Happy voting.